← Golden Globes as presidential auditions? The eastern hemlock was once one of the most ubiquitous conifers on this continent. By 2030 it will likely be gone forever. Sometime in the 1950s an invasive parasitic insect, the hemlock woolly adelgid (HWA), was accidentally imported from east Asia, probably Japan. The aphid-like adelgid has no natural predators in the Americas, and hemlocks and spruces here have no resistance to it. For half a century only cold weather checked its spread, however a warming climate has brought an east-coast explosion of the pest. In 2009 the HWA reached New England, the primary range for the eastern hemlock. Existent stands of this stately evergreen have been decimated, and hopes for its recovery and survival are dim at best. 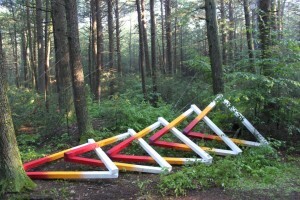 Harvard Forest is a 3,000-acre research preserve operated by the university, and located near Petersham, Massachusetts. It is home—for now—of one of the largest surviving stands of eastern hemlocks, although these too are under sustained attack by the HWA. 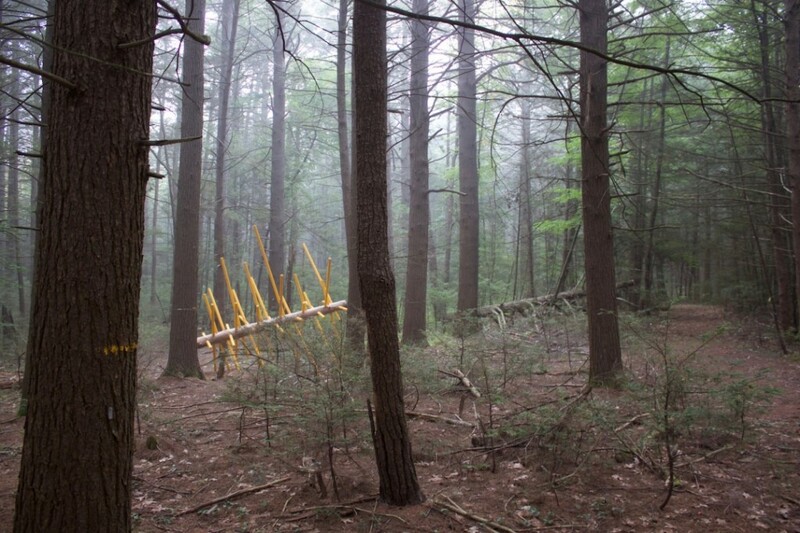 In an effort to educate the public about species loss, and to also offer a somber salute to a dying friend, Harvard Forest is hosting Hemlock Hospice, an art and science collaboration focusing on this slow-motion ecological disaster. 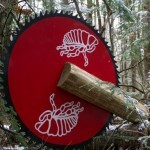 Created by artist David Buckley Borden and ecologist Aaron Ellison, the installation consists of 18 deeply symbolic naturalistic sculptures, situated throughout the forest and intrinsic with both dead and living eastern hemlocks. These are augmented with educational kiosks describing the storied past and mournful fate of this tree, and the broader ecology that exists with and around it. Hemlock Hospice is an open-air, self-guided installation, and is scheduled to run through November, 2018. The Sixth Great Extinction, meanwhile, presses on. 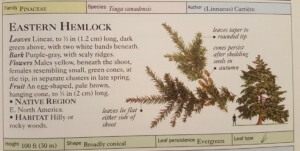 This entry was posted in New Post and tagged Aaron Ellison, climate change, David Buckley Borden, eastern hemlock, ecology, Harvard Forest, Hemlock Hospice, sixth extinction. Bookmark the permalink.